Heinrich Wurzer was serving with JG 302, flying “Wilde Sau” missions equipped with Bf 109 G-5 and G-6 single-engine fighters against the RAF night bombing offensive, in November 1943. Hauptmann Wurzer was assigned to 1./JG 302 based at Jüterborg-Waldlager in Germany. During the night of 22 November, he shot down a RAF Lancaster four-engine bomber as his first victory. On 14 January 1944, Wurzer was appointed Staffelkapitän 1./JG 302, replacing Oberleutnant Herbert Petersen who had been killed in flying accident. In the evening of 20 January, he claimed a RAF Halifax four-engine bomber shot down near Berlin to record his second victory at night. Wurzer recorded his first day victory on 30 January, when he shot down a USAAF B-17 four-engine bomber B-17. On 6 and 8 March he shot down two USAAF Viermots to record his 8th through 11th victories. Wurzer claimed his 12th victory on 5 April, when he shot down a USAAF a P-51 fighter. 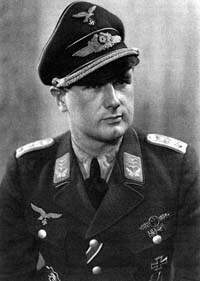 On 29 May, he led his Staffel against a USAAF four-engine bomber formation and claimed two B-24 Herausschüsse for his 19th and 20th victories, while his unit recorded a B-24 destroyed and another two Herausschüsse. Wurzer shot down B-24 east of Wien on 8 July and a minute later added a B-24 Herausschüsse. However, he was wounded in the right arm during this combat and had to make an emergency landing with his Bf 109 G-6 (W.Nr. 441 613) near Götzendorf airfield. This injury kept Wurzer away from combat duty for a more than a month. Wurzer was appointed Gruppenkommandeur of I./JG 302 on 28 August 1944. In September I./JG 302 was reformed as III./JG 301 and re-equipped with the Fw 190 A-8 fighter. A new commander, Hauptmann Wilhelm Fulda (1 victory, RK), was named to lead the unit, not Wurzer – the reason is unknown. Details of Wurzer’s subsequent military career are not known. Heinrich Wurzer was credited with 26 victories. All his victories were recorded over the Western front. He recorded 24 day victories. Wurzer’s victory total includes 23 four-engine bombers. He claimed two victories at night on Wilde Sau missions.